Announcing Spring 2019 Work Permit Certification Workshops! 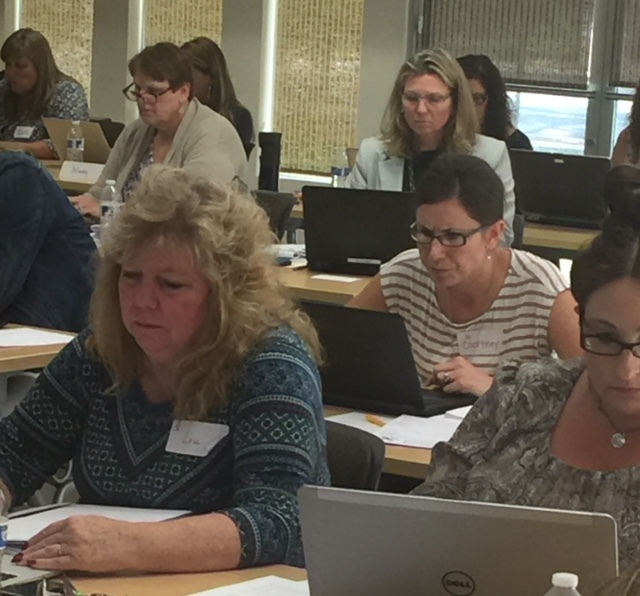 We are now accepting registrations for six different WPCT workshops. Find the city and date that suits you best and click on that link, as found in the Main Menu under Events. A workshop fee of $200 per person includes Workshop, Morning Snack, Q&A, Training Materials, Forms, WPCT Exam, Test Insurance and Lunch. Please direct any registration questions to Robin Whetzel. Most workshops are open to all interested parties, unless otherwise specified. For more information on CAWEE's Work Permit Certification Trainings, refer to the Main Menu item under Events. MAKE PLANS NOW…SAVE THE DATE!! It’s time to get those requisitions in and prepare for October 2019!! In 2017 we had a great conference in Sacramento…and we will return to the same location for an even better opportunity for you to enhance your Work Experience programs. Keep your eye on the CAWEE website for registration information and details! Available in March 2019!! Calling for Workshop Presenters for Fall Conference, October 2-4 2019!! It is time to submit your Request for Presentation if you are interested in holding a workshop at our Fall Conference October 2-4, 2019, in Sacramento! The RFPs will be reviewed at our June Strategic Planning and you will be notified then! Don't miss this opportunity to participate in the best conference for work-based learning in the area! Click here to access 2019 RFP! The deadline for RFPs is June 14, 2019! CAWEE Scholarship Application Window is Now Open! Be sure you are familiar with all parts of this application in order to answer your students' questions. Good luck to our future leaders! Download the 2018-19 Scholarship Application Here. In order to keep CAWEE strong, we need people with fresh ideas, energy, and the willingness to become a leader in our association. If that sounds like you, please consider running for an office. Serving on the E-Board provides a wonderful opportunity to meet and work with others and have an influential voice in the future of this organization and your job. 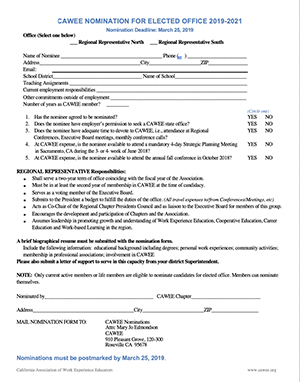 CAWEE is now accepting nominations for positions on the Executive Board for one each Northern Representative and Southern Representative for the 2019-2021 year. Candidates for an elected position on the E-Board must be a member in good standing. Job description and duties are on the nomination form. Deadline to receive your nomination and brief resume is March 25, 2019. Download the 2019-21 Nomination Form here. On Thursday, December 6, 2018, a month after the Camp Fire in Paradise California, a CAWEE check for $5000.00 was presented to the Butte County Office of Education for the purchase of laptops or Chrome-book style devices for the community school children displaced by the fire. On hand to receive the check was Steve Monahan, Director of Information Technology Services, Butte County Office of Education; Michelle Zevely, Assistant Superintendent, Butte County Office of Education, Student Programs and Educational Support; along with CAWEE representatives Jacqui Windsor, WEE Coordinator for Chico High School and former CAWEE Northern Representative, and Mary Jo Edmondson, Immediate Past President of CAWEE. 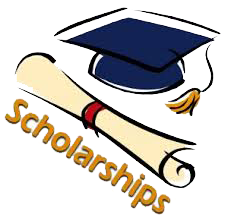 -- Send in your Nominations for CAWEE Northern or Southern Rep.
-- Let your students know about the CAWEE Scholarships! -- Save the Date: Get your district's approval to attend the CAWEE 2019 Fall Conference! -- Do you need to Become Certified or Update your Work Permit Certification? Check out the upcoming workshop dates. -- Do you know someone who would be a Valued Presenter at our Fall Conference? Send them an RFP - see above. Questions for or about CAWEE?